One of the marvellous things about being invited to a book festival is meeting the organisers behind it. Usually there is a small committee of dedicated individuals who come together as a team to bring books to young readers. Often there is a chairperson who helps keep everything flowing in one direction. Quite a tricky task when you think of the logistics. 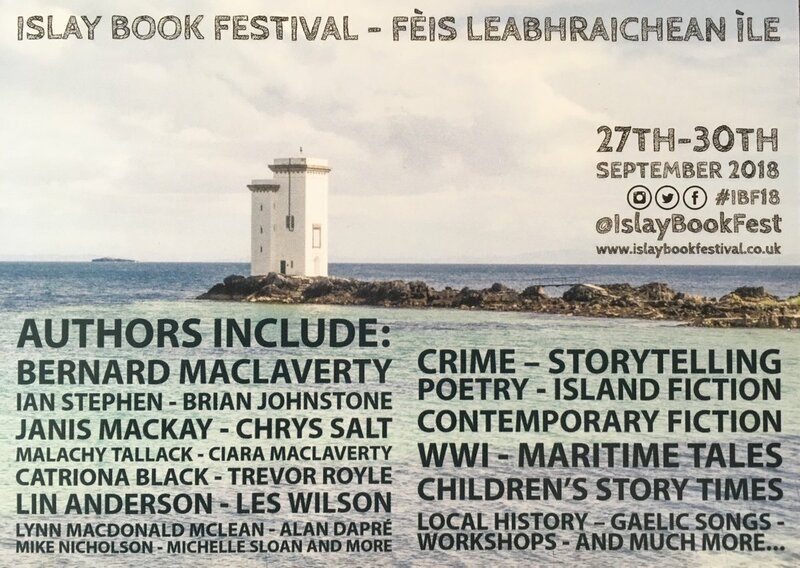 Folk organising Book Festivals manage to be in ten places at once, all the while never once complaining (in earshot), always smiling (in, er, eyeshot). This is quite an achievement. They also have the herculean task of remembering everyone’s names. Or correctly typing out millions of Name Badges. They must ensure we writerly types get to where we are meant to be. Plus keep us fed and watered, calm and focussed. Some authors can be terrified of the whole ‘standing up in public’ thing, being introverts who’d rather hide behind words or the organiser. Occasionally, one or two authors can be grumpy ‘Do I really have do this?’ types. Known to grumble when asked to sign old copies of books that young fans bring in. They reluctantly read out a few sections from their books. Wearily answer ‘the same old questions‘, then scarper to the Green Room to eat all of the chocolate digestives. The majority of authors get a buzz from interacting onstage with kids. By the end of each session, we are glowing with pride at a job well done. Whether performing in front of four kids or four hundred, we give it our all. Then collapse in a corner…and sign books. Then collapse in another corner. 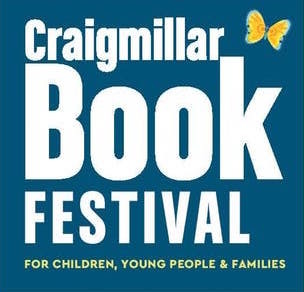 I am blown away by the energy and enthusiasm that Book Festival volunteers bring to each Book Festival. This entry was posted in Have Kid Will Scribble and tagged alan dapre, Author, aye write, AyeWrite, Book Festival Organiser, Byres Road Book Festival, children's author, Childrens Book Festivals, discover kelpies, Edinburgh Book Festival, Falkirk Storytelling Festival, Islay Book Festival, Killearn Book Festival, Killearn Childrens Book Festival, Ness Book Fest, NessBookFest, Organising Festivals, Porridge The Tartan Cat, ReimagiNation, TamFest, wee write, WeeWrite, West End Festival on October 30, 2018 by admin. Back in 2013, my young daughter did not want me to put on any ‘voices’ when I read to her. It was called something like Peppa Pig’s Daddy Is Made To Look A Right Nugget Again. To save my sanity, I slipped in voices from the TV show. My Mrs Rabbit was okay. My Madame Gazelle was spot on and I did an uncanny Daddy Pig – basically lots of booming and chuckling. My Peppa Pig was woeful though – wrong pitch and tone. “I told you – don’t do the voices!” she said, sounding exactly like Peppa. These days (nights?) it isn’t so easy to get reading time together. I have deadlines or maybe my daughter’s gone to bed VERY late…. So I say goodnight and leave her reading quietly to herself. “Dad! I need you,” yells a plaintive voice when I am halfway down the stairs. I go back up and pop my head around her door. “What do you want?” I know what’s coming. “A story.” I get the tried & tested It’s just one story look. Works every time. So nowadays we both take turns being the characters. Such is life. You couldn’t make it up. 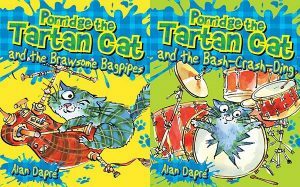 Alan Dapré is the author of the popular Porridge the Tartan Cat series. This entry was posted in Have Kid Will Scribble and tagged alan dapre, alan dare blog, bedtime stories, blog, book blog, books at bedtime, children's author, dad and daughter, do the voices, growing up, Peppa Pig, reading for pleasure, reading together, sharing books on January 24, 2018 by admin. My young daughter swerves by me and stubs her toe on a door. I hold out my arms to give her a big hug and…she hops straight past. Hops all the way down the hall. Hops into the kitchen…yelling for Mum. “What am I good for?” I ask, with a mock glum face. “I think she’s feeling okay now,” says Mum. “My foot still hurts a bit,” says the wee girl, angling for more attention. “Come to Dad and get a big hug,” I say, crouching down and stretching my arms wide. “It’s the same stuff!” I protest. And accidentally catches her shoulder on the door. This entry was posted in Have Kid Will Scribble and tagged alan dapre, being a Dad, comfort, cuddles, fatherhood, gender, gender equality, hugs, hugs and cuddles on January 18, 2018 by admin. I’ve just come back from a local discount store, my arms full of gardening equipment and my head full of questions. While shopping, I overheard a woman speaking into her mobile phone – loud enough for the whole store to overhear. Yeah – that’s true. Funnily enough, I don’t really want the Toy aisles stocking working AK47s. Doesn’t seem right somehow. My daughter is in the Toy aisle of a well known ‘stack them high, sell them cheap’ discount store. The boys’ toys aisle. The girls’ aisle is a row of eye-aching pinkness, stacked with cheap dolls and nail painting sets. The boys meanwhile have Dr Who, Ben 10 and bow & arrow sets. I explained that there was no such thing, despite us being faced with a long wall of blueness. ‘I don’t want a Dalek,’ says Isla. ‘But you’d like a skateboard,’ I say. She goes down a new aisle and points out a Hello Kitty Mini PINK skateboard. My daughter’s actually said it. For the past 4 years I have been trying to be gender neutral. She has had Fireman Sam and Cinderella dressing up clothes. A Doctor’s medic set too. There’s a wooden train set, a dolls’ house, a Playmobil Pirate Ship …. Basically a real mix of toys. Yet Isla now equates pink with girls and blue with boys. I blame the advertisers – the sort who have have girls lip-synching along whilst skipping about in glittery pink shoes. The sort who show boys playing with transforming cars and girls playing with sparkly pink ponies. I ask Isla what she thinks about toys for boys and girls. ‘There are no such things as just toys for girls or boys. You can play with what you like,’ I say, with poor grammar but good intentions. Isla spies a pump action water gun. It is too much like an assault rifle for my liking. ‘Now what shall we get your friends for their birthdays?’ I say, changing the subject. I grit my teeth and take two Disney Princess money boxes to the tills. At least they are the Paint-Your-Own variety. Apparently the birthday girls loved them. This entry was posted in Have Kid Will Scribble and tagged alan dapre, bad kids ads, blue and pink toys, boys toys, children's advertising, gender bias, girls toys, mumsnet blog, pink and blue, pink stinks, positive parenting, stereotyping girls, toy guns on August 23, 2017 by admin. Hobnob With Celebs: Remember that celebrity author you bumped into once at Waitrose/Aldi? (They probably won’t remember you.) Simply stand in the same spot and hope that lightning strikes twice. If it does – hand over your manuscript and wait for their agent to call. Milk Your Contacts: Ask your best mate’s friend’s aunt’s mother’s cousin’s sister in law who knows someone who works in publishing…to ask her best mate’s friend’s aunt’s mother’s cousin’s sister in law if she would ask someone who works in publishing to publish your book. Do Something Unusual: Go around the world on a unicycle while Juggling scorpions. * You’ll probably fall off & require medical attention – which will get you media attention…a book deal, 2 minutes on Oprah, etc. Do Something Dull: Some YouTubers simply unwrap stuff and get millions of online visitors. 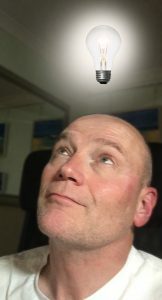 Why not fix a camera above your desk and let people see every word as you write it. You’ll be amazed at how folk will love watching you write. And love commenting about your grammar and punctuation. Marry Into The Royal Family: Then write tales about a helicopter. Streak At A High Profile Sporting Event [With Your First Chapter Tattooed On Your Bottom]: How much you’ll get noticed really depends on the size of your bum. Go Small: Write your book on a pinhead and get it into the Guinness Book of World Records. This entry was posted in Floris Books, Writing For Children: Tips by Alan Dapré and tagged alan dapre, Author, children's book, discover kelpies, Floris Books, getting published, how to be published, how to get a publishing deal, loch ness mess, Porridge, publishing advice, Scotland, scottish books, Tartan Cat, Young Kelpies on August 18, 2017 by admin. Writer’s Block strikes all of us at some time or other so maybe Writers’ Block is a more accurate description? Here are some ways you might beat the block! Open a drawer and pull out a random object and write about that in a style of your choosing. Breathless Mills & Boon prose about a stapler anyone? Write a list of things you dislike about your main character. Then generate some positives to add balance. Get away from the typewriter and use a pencil and some sticky note pads. Stick ideas into a small notebook. You can always remove the rubbish ones into the rubbish bin the next day. Sniff the way forward by imagining what the location of your story smells like. Throw in unusual scents to generate a sense of place. Give characters and places a potted history – no more than a paragraph written on the fly. Ask a question – ‘Why?’ and try to think of a situation that gives you an answer. Write a verb and get the computer synonym maker to chuck new words out at you – a different or unfamiliar word may get the character talking or acting in a different style. Turn on the TV and grab a headline (one that is positive) and think about your characters and how they would react to it. Write a note for your character – the sort you’d find left on a fridge. Revisit first lines from books in your house – and play with them. Time yourself and try to write 200 words in 10 minutes – anything. Think about what your character most needs at the moment. Then try to get it down, jousting its needs with other key characters. Flip the issue over if it’s a problem that’s stumping you, e.g., if a character is too dull then try to make them too interesting – by going Over The Top! Nick ideas from friends & family either by telling them you’re stuck, or by eavesdropping on their conversations. Amazing what you can pick up and play with – just don’t use real names when it comes to publication. Use rhyme – forcing yourself to think of simple rhythmic sentences. Often, a narrative will come. The idea here is to just get something down … to clear the blockage. If one thing doesn’t work, try another. And if that does not work then, er, do a blog … Works for me! Think up dramatic, funny, quirky opening lines – and really play with the scene, character or place – pushing them as far as you can. This will lead you into areas that you would not normally go. If you struggle with this then play with the last line. Apparently J.K. Rowling had the last line of her last book ready before she finished the first book. I tend to think about how the action might wind up and conclude – so writing a final line seems to make things more concrete. It always helps me to know where I’m heading narratively. Wander around the house picking up props – which can easily become prompts for new ideas. Maybe you’ve a figurine from Africa that sparks off a story set there … ? Get in the car, or put on your boots, and take a journey – heading for an unfamiliar place, object, house – whatever – as long as you examine your feelings when you arrive there. Being in a fresh environment can conjure up vivid new ideas and thoughts that you can mull over on the way back. Begin with ‘What If …’ and say aloud something outlandish or mundane. Let the ideas follow on from each other. Maybe it’ll help to dictate to your computer, or chat to the dog? Just getting words out and hearing them gives you ideas a reality that might spur you on imaginatively. These are just a few writing tips that have worked for me. Hopefully the few minutes spent reading them has got your brain juices flowing … I will add more the next time I’m hit by a wall of my Writer’s blocks. 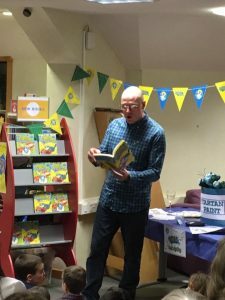 Alan Dapré is a published children’s author living near Glasgow in Scotland. His latest series is Porridge The Tartan Cat. 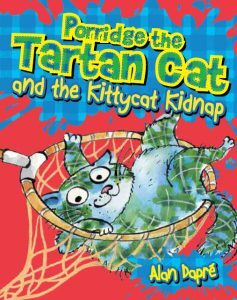 Packed with hilarious twists and fun wordplay, all with a cat’s-eye view of a zany Scottish family. This entry was posted in Floris Books, Published Writing and tagged alan dapre, beating the block, block, cant write, children's author, dapre, discover kelpies, Floris Books, fresh ideas, Porridge, Tartan Cat, writer stuck, writers, writers block, writing for children on June 1, 2017 by admin. One of my favourite childhood books was The Turbulent Term of Tyke Tiler by Gene Kemp. Tyke takes on the school establishment in an action-packed tale. It was quite a shock to discover the eponymous protagonist was Theodora Tiler. Most of the books I had read up until then featured boys doing all the exciting stuff. Being adventurous is a vital part of growing up for all children, not just boys. Books should reflect that. 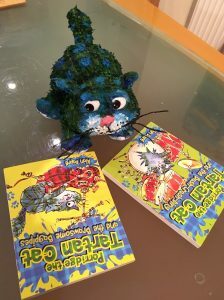 My Porridge the Tartan Cat books are funny, fast-moving, action packed adventures that anyone can read. 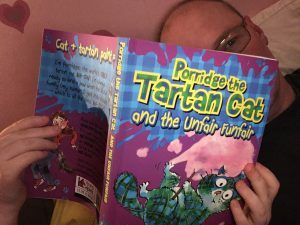 Twins Isla (named after my daughter, who calls herself Real Isla) and Ross McFun feature in every book of the Porridge the Tartan Cat series and star in two. Both characters are go-getting children, with enquiring minds who courageously work together to solve tricky problems. I chose non-identical twins because I wanted female and male characters who are equal but different. Children with the confidence and freedom to express and exchange ideas. In each book, they take turns to explore, to question and to lead. I’m not writing for girls or boys. I’m writing for girls and boys. My wife is an engineer – and a great role model for our daughter. Together we encourage Real Isla to try new things and believe in herself. Anything is possible. Last month she scuba-dived in a cage at Deep Sea World and loved every moment. Not every child gets a chance to do that. Or to be in a book like Real Isla. But all children should see characters with identifiable traits, and read reassuring books that show them it’s okay to be themselves. Books that nourish, sustain and empower children to be the best they can be. By the way, my daughter loves wearing her new dinosaur pyjamas. And I love that she loves them, too. 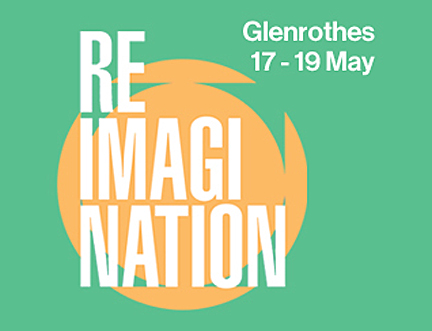 This entry was posted in Have Kid Will Scribble and tagged alan dapre, author blog, Floris, gender bias, gender equality, gender stereotypes, Kittycat Kidnap, Porridge The Tartan Cat, Tartan, writing for boysandgirls, writing for children on May 21, 2017 by admin. 1) Always read the genre you are aiming at and immerse yourself in the relevant books. 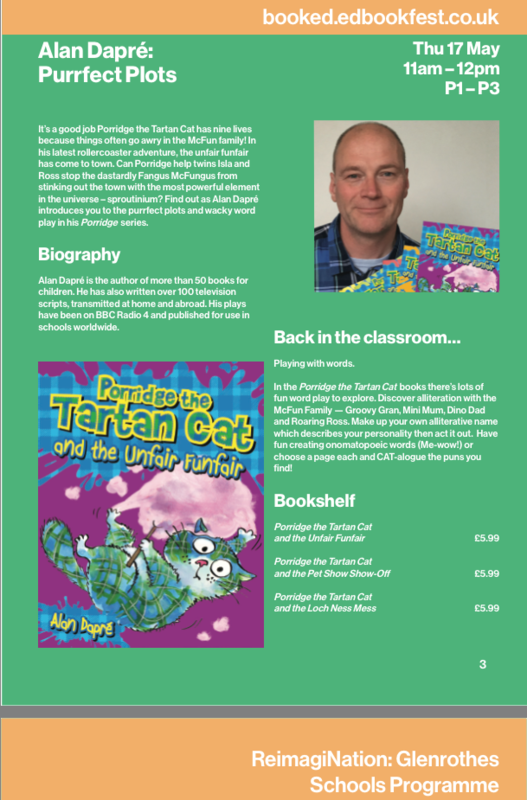 I have written plays for teenagers and younger children, general story and picture books, plus joke, puzzle, activity and story books for TV tie-in characters such as Brum. I used to think that my writing might be diluted by reading other writers. The opposite is true. I was able to pull their words and structures apart, agree (or disagree) with what I read, and get a sense of how each format worked. What I discovered somehow filtered into my own writing. 2) Grow up surrounded by books. This riffs on my first point. Obviously you can’t go back in time and surround yourself with books but it helps if you have had a childhood love of reading. Fiction, non-fiction, who cares. Just getting words into you is a positive and life-affirming benefit. 3) Study the ways children (your readers) think and interact. Watch, listen and learn. Resist the urge to step in – any interaction from you will affect the dynamic. Become aware of the rhythms and patterns that youngsters adopt. It will make your own writing sound more natural. Children tend to say only what they need to say. They often repeat phrases and rework their sentences as they speak – so go with their flow. It’ll make you a better writer. There is no point writing something and getting all worked up about it before the ink is dry. I tend to write my stories in big chunks then go back and edit. This approach works, but only if I know the plot and the characters well enough. If I am too uncertain then it shows in my writing. Better to write a chapter and edit afterwards than write a paragraph and edit that. Rash editing can simply be masking your lack of preparation or understanding of the story or characters. If you believe your work is rubbish it will be. So pull out what works. Look for the strengths. Print it off, go for a walk, come back and read it at arm’s length. If you think it is going nowhere then stop…and start writing something else. 5) Buy a load of sticky notes. When I have a story idea I draw the main story arc. It gets me to explore actions and characters and motivations without too much fussing over the plot. I can see the way – or the roadblocks -ahead. I concentrate on ACTIONS. If characters are not doing something then they should not be in your story. Stories are about DOING. Sticky notes can be easily rearranged, drawn over, replaced, etc. They are brilliant. You can do the same using virtual notes on your computer desktop or tablet screen. Trust me, it works. Life for a writer is tough. For every rejection send your stuff out to three, no, ten more publishers. Who knows why someone gets lucky and is published? It could be that they have written the best kids’ book EVER. Maybe they simply approached the agent/publisher at the right time. The key is to build relationships. Get known as a hardworking, imaginative writer and your reputation will help you get more work. When you get rejections – and you will – channel your writing energy into new projects. 7) Be nice to everyone. B) Publishers and Editors and Agents move about, get promoted, lunch together, etc. Some may even talk about you. You want that to be in a good way. 8) Write as much as you can. You don’t have show it to anyone – just write and see what happens. If you would to see my latest books, please click on the covers. 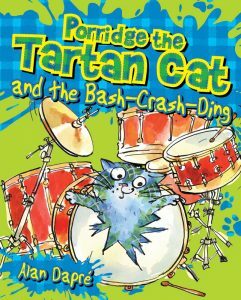 This entry was posted in Floris Books, Published Writing, Writing For Children: Tips by Alan Dapré and tagged alan dapre, dapre, getting published, how to write, Porridge, Tartan Cat, writing for children, writing genres, writing hints on March 16, 2017 by admin. 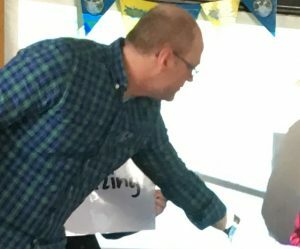 Ways to make your author visit amazing! They wanted to know what the author was like as a child. Pupils like a backstory and to know more about an author’s life. They enjoyed hearing the similarities and differences to their own lives. They were keen to discover what motivated an author to write stories. The children were fascinated by the small triggers. In my case, I wanted to write after enjoying books while I was in the care system. Stories can provide alternate realities where children are in control. 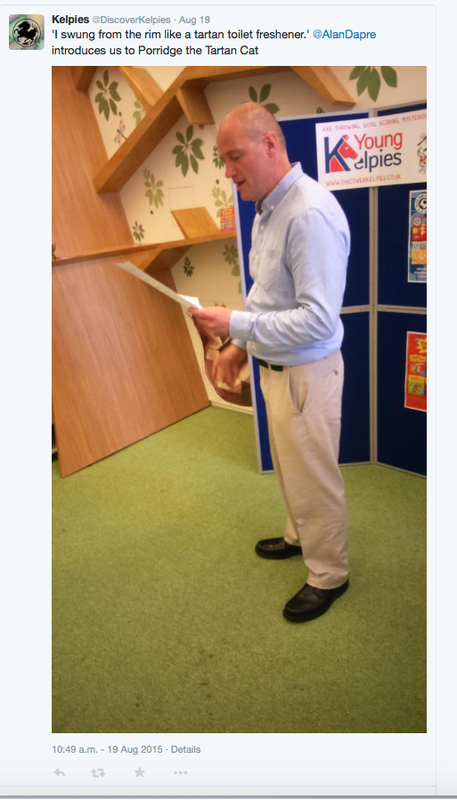 They didn’t just want an author to read extracts from their stories. An engagement was necessary. The ability to have a conversation about books and reading and stories that matter. They wanted eye contact and empathy. They wanted to laugh (or cry) and be emotionally moved. If an author had fun then the children had fun too. They were always keen to ride the emotional rollercoaster of a well-crafted story. From picture book to novel. They wanted to volunteer. To take part. Having an author ‘break the wall’ and go among the children – laughing and explaining and interacting – was a powerful thing to see. They wanted to feast their eyes on visual delights. It was important for the event to be an EVENT. A bare stage does nothing to motivate or engage the young audience. Props, bunting, posters, drapes, puppets all helped bring an author’s books and characters to life. They wanted to take a small piece of the author home. Metaphorically speaking. A memory. A book. A postcard. A kind word. A handshake. A smile. There were other things too. I will probably blog more on this another time. I’ve been busy preparing for school visits, festivals and other events. It’s important to me that young audiences go away with an eagerness (or renewed appreciation) for books. That we have truly interacted, had fun, talked, questioned, laughed, volunteered, smiled, etc. I won’t get everyone on board all the time but I don’t feel I need to. Reading is a journey with many stops and starts, twists and turns. 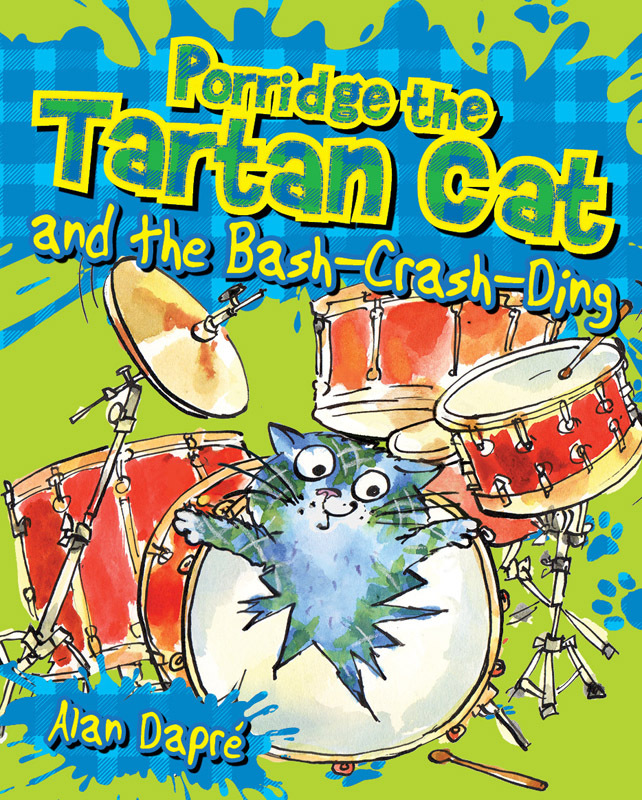 This entry was posted in Alan's Events & Visits (schools, Floris Books, Have Kid Will Scribble, libraries & festivals) and tagged alan dapre, amazing author, author visits, Bash Crash Ding, Brawsome Bagpipes, dapre events, Porridge, preparing visits, pupil engagement, questions to ask authors, school visits, Tartan Cat on March 15, 2017 by admin. 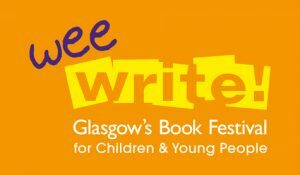 Back in 2015, I met the organiser of Wee Write! at an event where new books from Floris were being showcased. It seemed quite surreal to be chatting about half a dozen books I had not yet written. 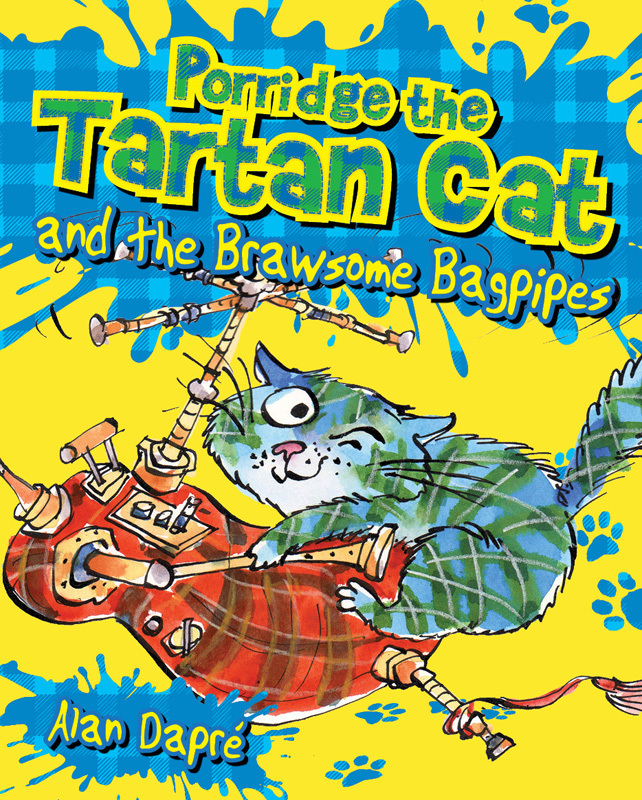 At that time, I was working on my first title – ‘Porridge the Tartan Cat and the Brawsome Bagpipes’ – and creating the style for the series. The six Porridge books can be read in any order, as they feature recurring characters but stand-alone plots. 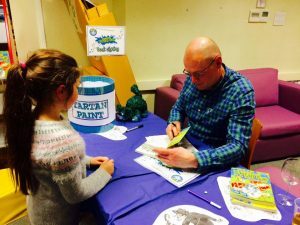 Just before the first two books were launched (Feb 2017) I was invited to take part in the Wee Write! schools programme. A great idea that brings schools into the Mitchell Library in Glasgow. It costs schools nothing and the children get lots from the experience. 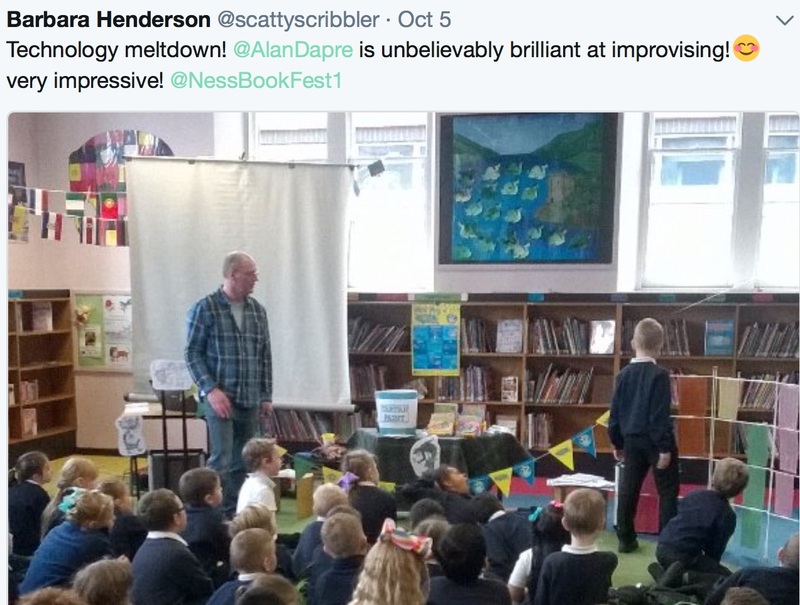 A morning – or afternoon – off school to watch authors and, in my case, engage in some silly wordplay and enjoy plenty of interaction. Yes, if you come to my event then be prepared to volunteer. Nearly 180 pupils, teachers and helpers filled a large space inside the library, overlooked by big windows and curious office workers. Helped by Janette (an experienced librarian) and knowledgeable technical staff, I was able to prepare my presentation and props in no time at all. The worst bit was hanging around the back of the projector while I was being introduced. As ever, I couldn’t resist a bit of silly shadow hand puppetry and that got the kids laughing. The stage was set for me to start. I was soon chatting about how my Porridge books came about. I then gave the children wee snippets about characters – aided by Yuliya Simona’s brawsome illustrations – and introduced Porridge (in soft toy form). and kids running about the stage sorting out muddled-up words. A lot of Porridgy goodness was somehow spooned into one hour. At one point, we created our own crazy competitions – aiming to be as daft as Gadget Grandad’s Scottish Shed Racing Championships. 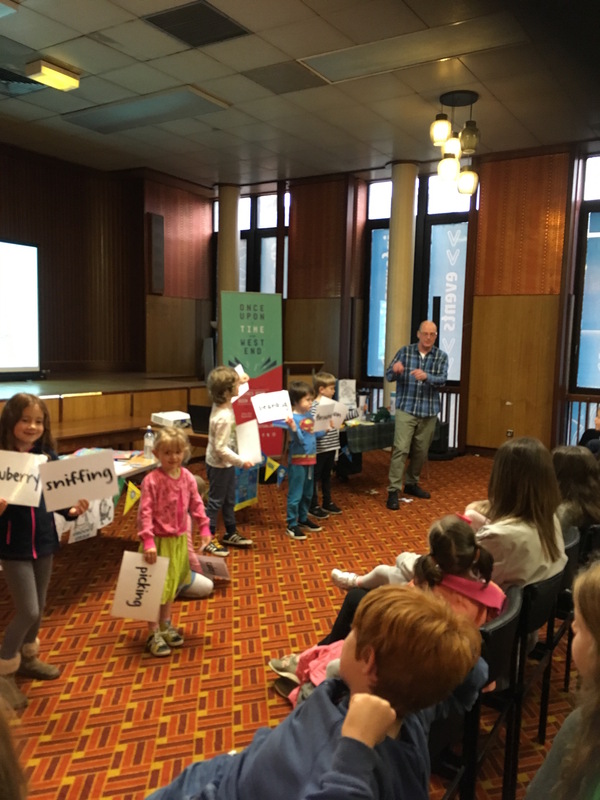 There was also a lively joining-in session where children danced around and mimed tapping along to a noisy tripe writer. Next we explored together facts that sound like a load of old (typed) tripe but are actually true! The hour flew by and everyone was hoarse and happy by the time my event ended. A short Q & A brought out some very good questions. “What’s my favourite book?” I was asked. I replied that it’s any book that’s being read. Books are meant to be read, to stimulate and engage. Judging from the reaction of staff and the kind comments afterward, the children went away motivated and excited. If libraries and authors can get children enthused by the written word then we are all onto a winner. Wee Write! is in someways an off-shoot of Aye Write! but it has its own special atmosphere. 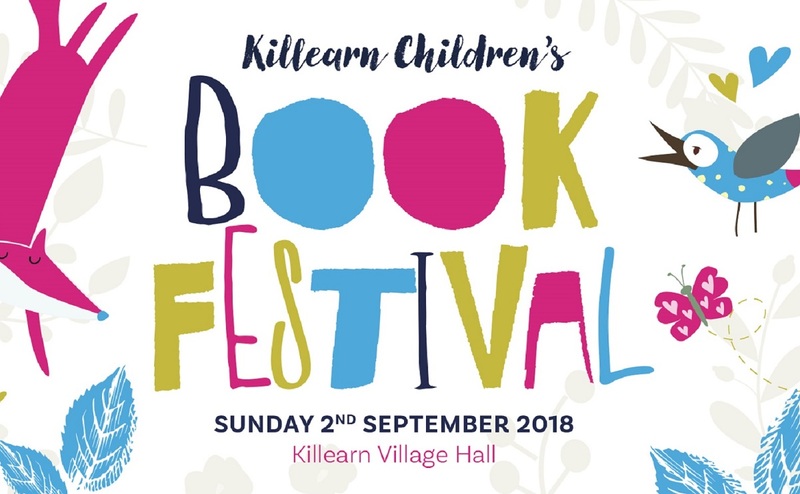 It offers a wee glimpse of the magic of books – and writing – to any kids (young or old) lucky enough to attend. I loved it. Good job too because I did it all again that afternoon. 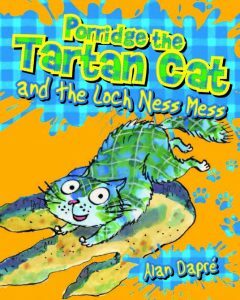 This entry was posted in Floris Books, libraries & festivals) and tagged alan dapre, alan dapré blog, Floris Books, Porridge, Porridge The Tartan Cat, wee write, wee write festival, yuliya simona on March 8, 2017 by admin. 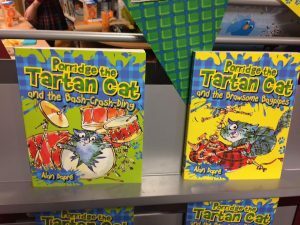 The first two stories in my Porridge the Tartan Cat (6 book) series were launched last week. 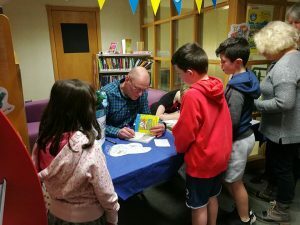 A large group of eager readers gathered at West Kilbride Library in Ayrshire, Scotland to discover more about a terrific tartan cat called Porridge, who lives with the McFun family in Tattiebogle Town. Staff from Edinburgh-based Floris Books (recently named Scottish Publisher Of The Year) were on hand to provide drinks and nibbles. I brought various activities and a tub of homemade fishy biscuits, Porridge’s favourite treat. Me-yum! The guests were entertained by an informative introductory speech about the series from Floris editor Lois, and then it was my turn. Cue lots of purr-fectly bad puns and a-mew-sing jokes from the author. I discussed how the books came about, way back in 2011. (I wanted to do a series about a family with secrets – a Grandad with awesome gadgets, a Gran who was once a groovy singer, etc). Then I talked about the characters and the way names had changed. For instance, Mini Mum was once Dinky Dad! And the name Porridge was originally used for a character called Doris Porridge. 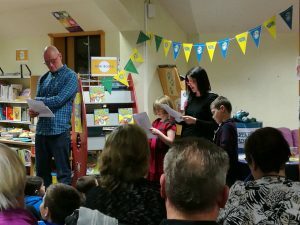 Another child and his mum – who is an excellent actress – also helped out with a reading from Bash-Crash-Ding! It was lovely to hear my words come to life in front of everyone. 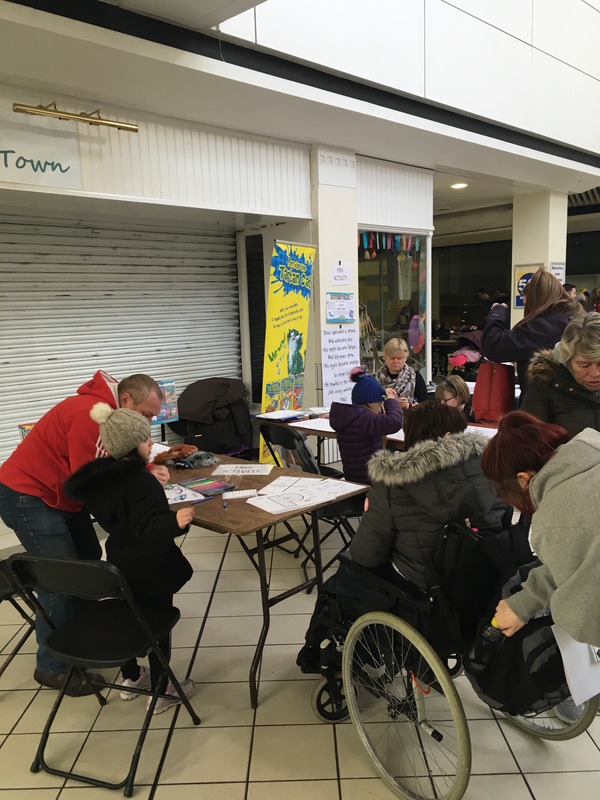 We ended with some more joining in activities and a signing session, while the children did table-top tasks and had a go at Pin The Tail On The Porridge. This is what it’s all about. Brawsome stories for kids. Books are available in-store and online with waterstones, amazon, w h smith and Floris Books. Plus other reputable sellers. 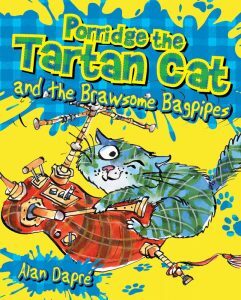 This entry was posted in Floris Books and tagged alan dapre, Author, BashCrashDing, Brawsome Bagpipes, Porridge, Scotland, Tartan Cat on February 19, 2017 by admin. I know I really should have been blogging this year but most of my time has been spent writing an exciting new 6 book series for Floris Books, a large publisher based in Scotland. Each story stars a member of the McFun family. Gadget Grandad, Groovy Gran, Mini Mum, Dino Dad, Roaring Ross and Invisible Sister. Nothing is ever what it seems in this fantastic family. Everyone has a surprising secret – and a knack of getting into trouble. 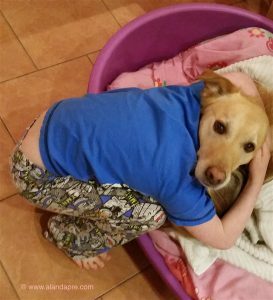 Luckily, Porridge is around to lend a helping paw and save the day. 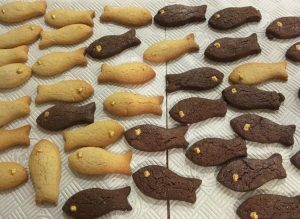 All it takes is courage and a box of brain-boosting Fishy Biscuits. It’s brilliantly illustrated by Yuliya Somina, who has illustrated for Bill Bryson’s bestseller ‘A Really Short History Of Nearly Everything’. Groovy Gran was once in a band called The Tattie Scones, but it split in mysterious circumstances many years ago. Porridge, the twins and Groovy Gran go on a mission to reunite the band members and put on a special one-off Big Gig. Unfortunately the dastardly Dug o Doom is on the prowl, trying to thwart their every move. Porridge is determined to save the day – and the show. Claws-crossed it will end with a fantastic Bash-Crash-Ding! I’ve seen the illustrations so far and they look very impressive. 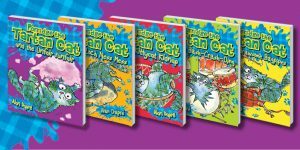 Energetic, fun and just right to capture the imagination of 6 to 8 year old readers. That said, there is enough word-play and imaginative quirkiness for grown-ups to enjoy too. Well, I’d better crack on. More stories to write. I’ll post more thoughts and exciting news later. This entry was posted in Floris Books, Have Kid Will Scribble and tagged alan dapre, alan dapré blog, ayrshire, Bash Crash Ding, book launch, Brawsome Bagpipes, children's author, Floris, Floris Books, Gadget Grandad, Groovy Gran, Porridge The Tartan Cat, Tartan Cat, Tattie Scones, Yuliya Somina on October 19, 2016 by admin. Launch of the ‘Young Kelpies’ range of new books. Mine included. I was delighted to be invited to attend the launch of the new Young Kelpies range. It features four series from exciting authors. ‘Axe throwing’, ‘goal scoring’, ‘mysterious’ and ‘adventurous’ are the key words for each series. Mine is the adventurous one…with lots of gags, wordplay and exciting action. 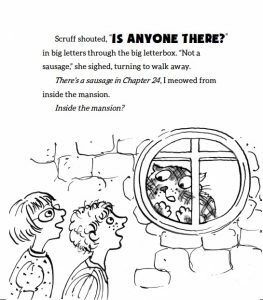 Each brilliant series has six books and is written for children aged six to eight. If you want funny and engaging stories then Young Kelpies will do the business for you. The launch was a light hearted affair where each author read an extract in front of the great and the good from the publishing trade. I was on last and could see how well the other authors were being received. I ate a bacon buttie and threw myself into my performance. There was certainly a lot of interest for my Porridge The Tartan Cat series. When Porridge was wee he fell into a tin of tartan paint. A tin of tartan paint. Not easy to say or do. Porridge loves sharing tales about the McFun family. He has even cat-a-logged all their funny adventures. Six books coming out in 2017. 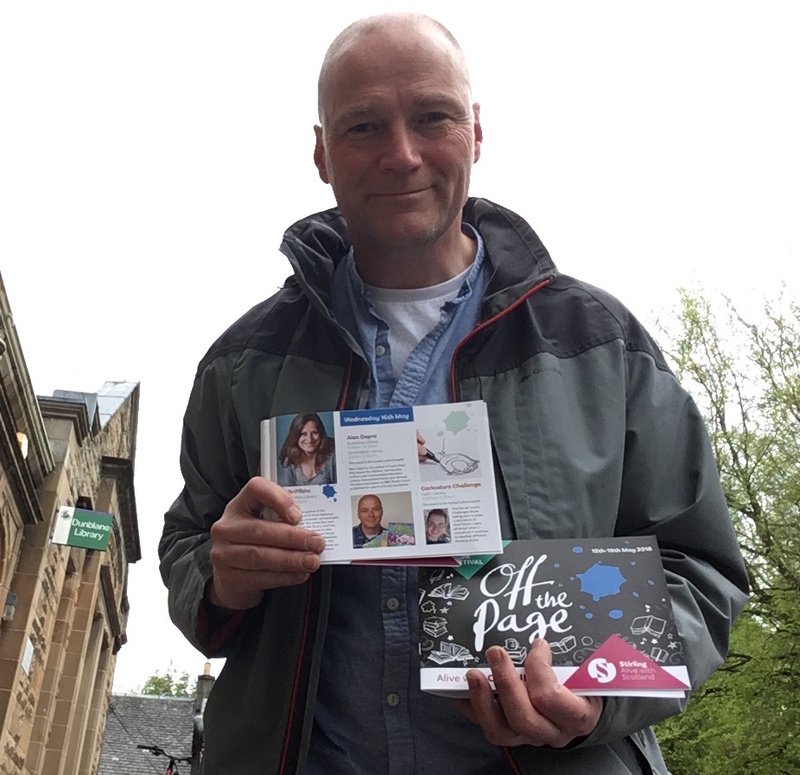 This entry was posted in Published Writing and tagged alan dapre, Edinburgh, Fiction, Floris Books, Porridge The Tartan Cat, Publishing, writer, Young Kelpies on August 23, 2015 by admin. I have taken time off from writing this blog to concentrate on writing children’s books. It takes a while to create meaningful, exciting and engaging characters who jump off the page, climb up your nose and playfully mess about with your brain. I shall be posting soon about some exciting new developments regarding my latest project – a series of humorous books for six to eight year olds, with a Scottish twist. As ever, what takes the time is getting something off the ground. Finding a publisher or agent who is willing to take a punt and develop your ideas is a slow process, with many hurdles to overcome. A writer may know his or her characters and plot intimately but this knowledge has to be imparted to others – never easy. I have developed some clear methods that I will blog about in later posts. 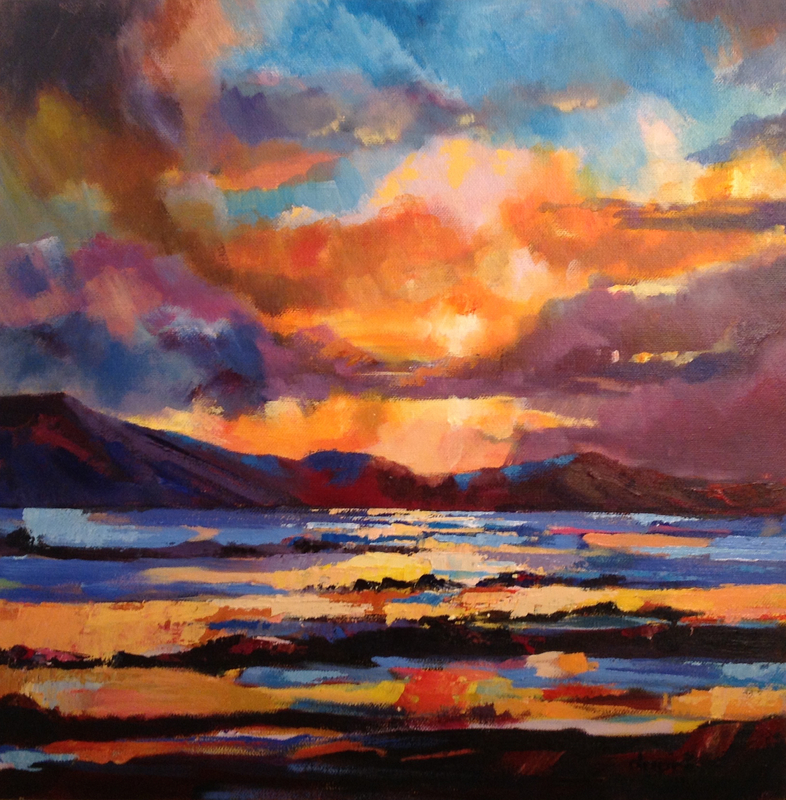 I have also been busy painting in acrylics just to give me a counterpoint. Staring at a blank computer screen day in day out is not healthy so I mix in a bit of staring at a blank canvas too. Going from one medium to another can alleviate blocks. I often come up with plot ideas while daubing on paint. Writing for yourself is a great way to begin. You will discover what subjects interest, motivate and challenge you. To write honestly you have to write from the heart, regarding the things you really care about. If you are creatively and emotionally engaged then your writing will reflect this. External critics will be kept at bay while you learn to master your internal one. Keep what you write private and you will be free to write what matters to you. Not having to impress others is a great thing. -Write about a subject you passionately love or hate. -Write about a personal secret that needs unburdening. -Write boldly about a fear or hope for the future. This entry was posted in Writing For Children: Tips by Alan Dapré and tagged alan dapre, alan dapré blog, author tips, children's author, getting published, quotations, why write?, writing for children, writing ideas, writing quote, writing tips on March 7, 2015 by admin. My Grammar School inconveniently forgot to teach me grammar. Fact. We had a few lessons about verbs and adverbs, prepositions and commas – and that was about it. When I became a Primary teacher I swotted up on the basics, while older colleagues banged on about the dubious merits of Box Analysis. As a published writer I am expected to know how words are strung together. I do – but I string them in my own sweet way, dropping convention when I see fit (or through ignorance). My aim is to keep things simple. Friends who speak foreign languages have a grasp of tenses – such as the Pluperfect tense in French. I vaguely remember that it had something to do with things already done in the past. The nearest English equivalent is the Past Perfect tense – ‘we had written, they had entered’. A man who for years had thought he had reached the absolute limit of all possible suffering now found that suffering had no limits, and that he could suffer still more, and more intensely. Here, “had thought” and “had reached” are examples of the pluperfect. They refer to an event (a man thinking he has reached the limit of his capacity to suffer), which takes place before another event (the man finding that his capacity to suffer has no limit), that is itself a past event, referred to using the past tense (found). The pluperfect is needed to make it clear that the first event (the thinking and the supposed reaching) is placed even earlier in the past. Dull. Dull. Dull. I get a headache just reading and thinking about it. Quick question. Do you know what makes a tense Perfect? Quick Answer. A tense is said to be Perfect when the action is over and complete. Hmm, I also remember the dreaded Past Participle. It is always used for perfect tenses… opened, eaten, rewarded. Perhaps it’s better not to dredge such stuff up. The Present Participle is used to create continuous tenses, which show when an action has been going on for some time – even if it started back in the past… I have been sitting here for ages. That brings me to Gerunds. They are verbal nouns, that always use a possessive adjective instead of a pronoun… I was upset about her leaving. Writing this, I can see why Grammar left me cold. It is vitally important but when taught badly is almost incomprehensible. Too much and you struggle, too little and you struggle. So I am heading for the middle way. I might use the odd Gerundive (verbal adjectives) but I won’t let the terminology get in the way of writing a cracking story. Surely they should be taught in a way that makes sense to them, using words that they understand. Horses for courses. By the way, does anyone know the difference between loose, periodic and balanced sentences? Hands up at the back! This entry was posted in Writing For Children: Tips by Alan Dapré and tagged alan dapre, box analysis, gerundives, grammar, grammar definitions, grammar schools, participles, perfect tense, pluperfect tense, school memories, using participles, using tenses on January 14, 2014 by admin.